Sara Ingrassia Interiors is a boutique residential interior design firm known for vibrant, unexpected and layered environments. The firm’s portfolio includes design, renovation, new construction, and project management. Her clients range from prominent business leaders to some of Hollywood’s elite. A native of Dallas, Sara frames contemporary and classic interiors through a lens of balance, scale, lighting, texture, and color. It’s less a thought process than it is an understanding of the whole picture. Her rich aesthetic is as much informed by art history and the galleries she experienced in her travels through Europe as it is by nature and the wide-open spaces of her family’s ranch. Ingrassia’s ability to move effortlessly across styles comes from her roots as an award winning set decorator in film and television, notably for “Austin Powers”, “Meet the Fockers”, and HBO’s “Carnivalle” for which she won an Emmy award in 2004. 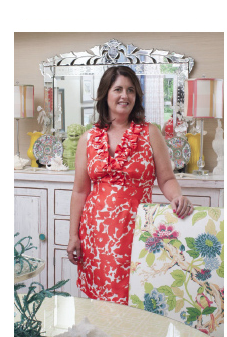 Sara pulls together sources from her 20 plus years in the design profession including, furniture, fabric, carpenters, finishers, drapers, painters, tile setters, artists, and many other skilled artisans to create her one of a kind interiors. She often designs custom furniture for her projects. Sara’s work has been featured in “Pasadena Magazine”, “The Quarterly”, “The Outlook”, “The”, “Set Décor”, “News Reel”, “The Hollywood Reporter”, and HBO’s “Behind the Scenes”. She has participated twice in the La Canada Home Tour, and on the Pasadena ASID Home Tour. She designed “Stories” a 4 part line of furniture for Mortise and Tenon in Los Angeles and for their on line store.